Change is never as simple as “step-by-step” guides suggest. Change is hard work which involves assistance and consistency over time. Yet, we must all make steps towards progress. Ed Welch recognizes both of these realities as he writes his “step-by-step guide away from fear and anxiety.” When I am Afraid is a wonderful resource for guiding people through fear to the God of peace. Written as a workbook it is designed to engage the reader at a personal level, making change more than just theoretical. The books seven chapters are written as meditations “on what god says to fearful and anxious people” (2). Designed as a seven-week study Welch highlights what our fears say and what God says back to them. The questions within each chapter are intended to engage the reader at the personal level, inviting us to do some self-evaluation and to think about our fears, not simply to react to them. Welch states one his goals for the book is to help readers “hone [their] spiritual instincts so that [they] turn to Jesus when [they] are anxious, rather than trusting in [their] ability to solve or deny problems” (2-3). To that end Welch is constantly pointing us to the God of Scripture who speaks powerful words of comfort and reassurance to His fearful children. The books seven chapters, designed to be studies and applied across a week at a time, cover the basic concept of fear, three common fears, and hope in God. 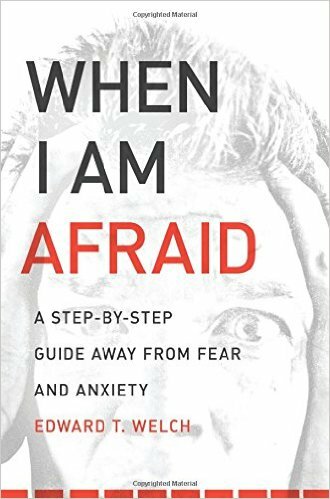 Readers who work through this book will learn how to listen to their fears and see how their fears highlight what they treasure. They will be challenged to repent of any sin and turn again to the God of comfort. They will also learn specifically what Jesus says about financial fear, the fear of death and pain, and the fear of man. In each case we will find truths to challenge our fears and confront them with hope. Finally, readers will be directed towards the character of God and the assurance of His presence. Throughout the book readers will see how to study Scripture for comfort and confrontation, but in the final chapter, Welch gives us a thorough meditation on Psalm 46. He models well for us how to do the kinds of Scriptural reflection and meditation that makes a difference in our lives. As a workbook, then, it is not simply communicating information but helping us to apply it to our particular fears and lives. In this regard it is a great resource for counselors to utilize with struggle individuals. It would also serve well as a small group tool. Combined with Welch’s larger volume Running Scared this resource will give much ammunition to the fight against fear and anxiety. While the latter book gives much more detail, the value of the personalized questions in the workbook cannot be overstated. In addition, the weekly goals reiterated at the end of each chapter give tangible things for individuals to work on and reflect on throughout the week. Again, Welch is not naively implying that just working through a book will make fear abate, it is a “life-long process,” he says. The weekly goals help to drive this point home. I really appreciated this book, finding more value in it than in the larger volume. Yet, combined with Running Scared, this is a great resource for fearful people and for those seeking to help them. I highly recommend Welch’s dual volumes.